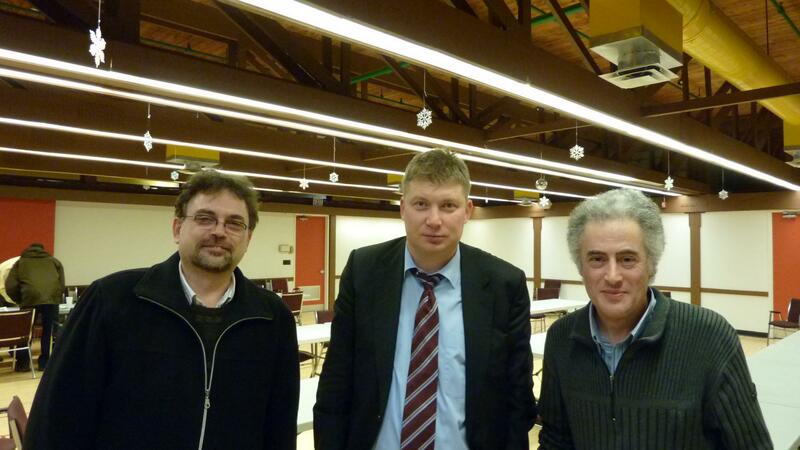 Yesterday GM Alexei Shirov visited our club and gave a simultaneous exhibition. Just to remind you that he was number four in the world in 1998 and twice reached the final of the world chess championship (his match with Kasparov didn’t happen and he lost to Anand in FIDE championship). I also remember him getting into World Cup final in 2007 and he played very well recently in Corus, getting the second place. I prepared to play Black and knowing that he likes Ruy Lopez, wanted to play the Marshall attack, though I found that he plays the line I almost never played. But in the club I saw that he allowed half of the players to play White and decided to take White. I got my Ruy (here is the game) and played the quiet d3, c3 line which has pretty good stats by the way. After the black-colored bishops were exchanged he offered to exchange the white-colored too, but I decided to avoid it, not wanting to get too simple, completely symmetrical position. We exchanged them eventually and I suspected that he wants to overplay me in the endgame, having a better pawn structure. I managed to get some initiative and Fritz thinks that by playing 27. Nd6 I could get 0.73 advantage. Generally speaking I felt like on some quiet island, separated by ledges from the storming ocean. On my left, Shirov initiated a series of heavy blows. After a few moves he had an exchange for 2 pawns, my neighbor tried to counter and finally the game ended in a draw, as I learned later. On my right I saw Shirov’s rock hanging on h6 (with the black king on g7) and it looked like taking it was leading to a mate. The guy didn’t take it, but got mated anyway. But my quiet existence finished too, as there only a few people left standing and Shirov started to come to my board pretty fast, it became almost a blitz. Right at that time he played 33… g4, and I could get an advantage just by taking the pawn. But I hesitated and we went into N vs. N endgame where he could get some advantage by playing 39… Nd6 instead of 39…. c5. I managed to counteract his threats and suddenly I heard him saying: “I offer you a draw”. Of course I agreed. That was a really happy moment. I asked him to write something on my scoring sheet, a few words and he wrote in Russian (he knew that I am from Russia) – “Congratulations on a good play!” and signed it. Then after all the games finished I was able to talk to him in Russian together with my friend and some other guy. He was really nice answering our questions and keeping the conversation. Then the organizer announced the result: +17, =6, -2. Taking into account a very strong playing field this result was very good. But it wasn’t all, as the organizer said that Shirov offered players to go over their games in his hotel (the club was closing), which was 5 minutes drive away. Of course I couldn’t miss it. So, let’s say you are a singer. Can you imagine a rock star sitting at the table in the bar with you and a few other fellow singers (there were 3 other guys besides me), drinking beer and talking about your songs and rock in general? That’s how I felt, sitting across super-GM, chatting and drinking my “Molson Canadian” – truly amazing. Shirov was very friendly and relaxed. First one guy went over his opening, closed Ruy and Shirov showed his erudition, throwing lines and mentioning the games where these lines were played. Then we went through my game and the level of his analysis was very high. He saw the better moves right away and was critical of some of his own moves, especially 33… g4. He basically found everything what Fritz found later. After spending almost an hour I had to leave, they were still looking at the next game. I am still under huge impression of his personality, both as a chess player and a human. I just got a nice photo, here it is. It’s right after simul ended, I am on the right, in a blue shirt, on the left my friend from work, also playing chess and in the middle – GM Alexei Shirov. Copyright 2010 by the photographer David Cohen. Last Thursday I was able to attend lecture and simul given by GM Evgeny Bareev. He is an elite GM, in October 2003 he was in fourth place in the world rankings, with an Elo rating of 2739. He reached the quarterfinals in the FIDE World Championships in 1999 and 2001, and was a semifinalist in the Candidates Tournament for the classical world championship at Dortmund 2002. Also he was a second to Kramnik in his matches with Kasparov and Leko. He wrote a book “From London to Elista” which became a winner of the English chess federation 2008 Book-of-the-Year Award, the most prestigious chess book prize in the world. The lecture was about Caro-Kann, which he is playing, also he answered some questions. I was impressed how easy he was throwing variations and lines, at the same time showing the whole picture of the opening. By the way, the “hot” line now is 1.e4 c6 2. d4 d5 3. f3 – never saw it. I already tried it blitz and started also correspondence game with it. He talked about World Championship match, said that there is a chance that it will be in Sofia if there will be an additional 500,000 – 700,000. He said that there are tough times now, with the sponsors disappearing one after another. I asked him, what about Carlsen or Aronian becoming World Champion in the next 3 years and he said – definitely. He has a great sense of humor and the audience was really enjoing the conversation. Then the simul started, there were 24 people playing. I was glad to get 1. e4, but his second move 2. Bc4 got me thinking. Crafty says I had to play 4….d5 here, I agree, I played 4 . … Nc6. 5. Nf3 d6 6. O-O O-O 7. Nc3 Bd7 8. a3 h6 9. f5 – this is for playing too passively. 9. f5 Re8 10. Kh1 Na5 11. Ba2 c5 12. Rg1 Rc8 13. g4 c4 14. g5 – Crafty still estimates it only as 0.18, but I already had a bad feeling. 17. Nd5 Qd8 18. Qd2 Kh8 – threatened Qh6 19. Rg3 f6 – another bad move, Crafty offers – 19. … cxd3 20. Qxd3 Nc6 21. Rag1 Bxf5 22. exf5 e4 23. Qc4 exf3 24. Rxg7 with 1.6 estimate. 20. Rag1 Rg8 – Crafty again recommends cxd3 and Bxf5. 21. Nh4 Ng5 – I saw coming sacrifice, but g5 just prolonged the agony, so I decided what the hell! He thought max 2 seconds, then 22. Qxg5! – Black resigned (22. … Qe8 23. Rh3 fxg5 24. Ng6# or 22. … fxg5 23. Ng6+ Kh7 24. Rh3# ). I asked for his autograph and he signed the score sheet. I was consoled by the organizer that one of the participating masters lost at the same time. The total was – +19, =3, -2, there were a few masters and experts, the rest I think – “A” and “B”.